Butter cookie dough are piped to form beautiful roses and swirls and baked to perfection. 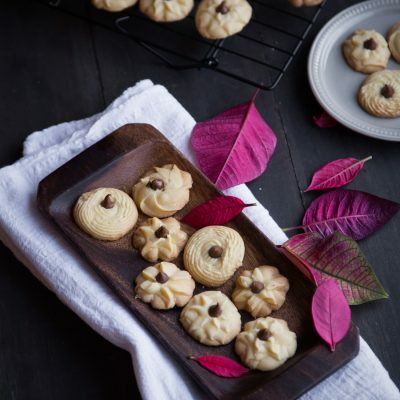 These buttery and crumbly cookies are popular in Indonesia during occasions like Chinese New Year and Lebaran/Eid Al-Fitr. In a mixing bowl, mix all the dry ingredients and set aside. Once the butter has softened, place the butter and sugar in a bowl of the stand mixer, use the flat beater and mix at low speed for 1 minute and then increase the speed to medium and mix until the sugar and butter is mixed through, about 2 minutes. Add egg yolk and continue to mix. Switch to "stir" and then gradually add in the dry ingredient mixture in 3-4 batches until you get a thick batter.